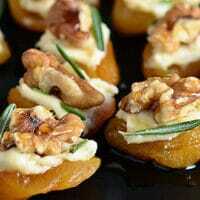 Dried Apricot Blue Cheese Canapes with Walnuts. A simple, elegant and delicious hors-d’oeuvres recipe perfect for any holiday party. It’s Friday and the Holidays are upon us. So, a few of my friends and I decided to host a Holiday Happy Hour–blog style! You’ll be able to hop around to all 10 fabulous blogs to get the appetizer and cocktail recipes each of us brought to the “party”. Fun right? If you are visiting from Celebrations at Home, welcome!! Now let’s grab a napkin and glass and get this party started! I don’t know about you, but holiday parties present a few challenges for me……… such as making yoga pants look classy enough to wear to a holiday dinner, volunteering for dish duty to avoid conversations with crazy Uncle Mike, and restraining myself from eating all of the Dried Apricot and Blue Cheese Canapes with Walnuts before the guests arrive. The struggles are real, people! Making a delicious appetizer for a party doesn’t have to be a struggle though! 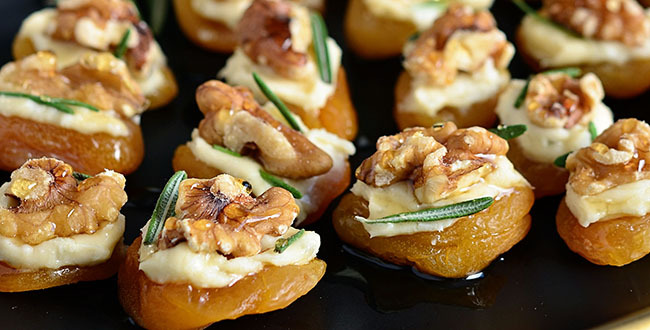 These Dried apricots and Blue Cheese Canapes with Walnuts come together in no time. They are simple, yet elegant enough for any kind of party. Don’t let their small size fool you, the little bites are packed with flavor, sweet, tangy, salty all in one punch. Not to heavy and perfect to nosh on before or after a meal. When I was in Tahoe last month Sandy made an Apricot Almond Appetizer that I haven’t been able to get out of my mind. When I got home, I decided to make them with walnuts and blue cheese. I love that this is an appetizer recipe that you can make a few hours early (or the day before) in just a few quick minutes. 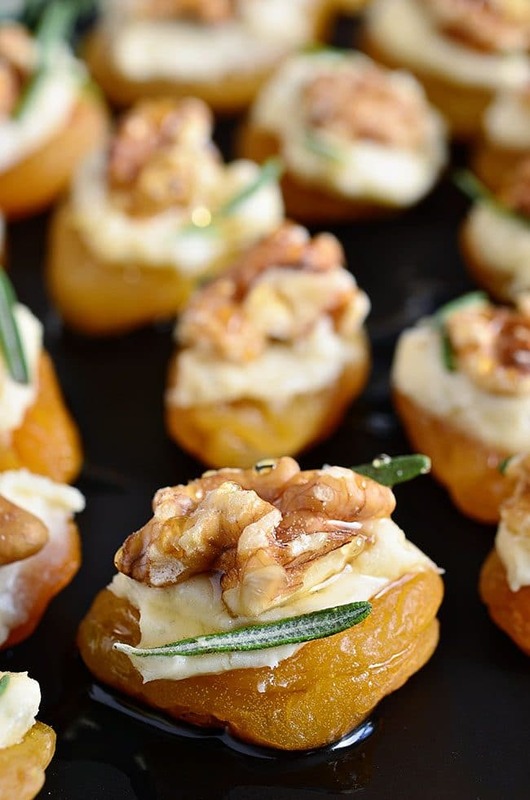 Then set out the Dried Apricot and Blue Cheese Canapes with Walnuts before the guests arrive to get to room temperature and drizzle with the honey. They look so pretty on a plate or platter…..garnish with a sprig of rosemary on the serving dish for a simple presentation. These little morsels are the perfect easy appetizers. as for my other struggles……..skinny yoga pants with boots and a big comfy sweater and no one will be the wiser 😉 BAM! Print this easy Dried Apricot and Blue Cheese Canapes with Walnuts appetizer recipe at the end of this post. 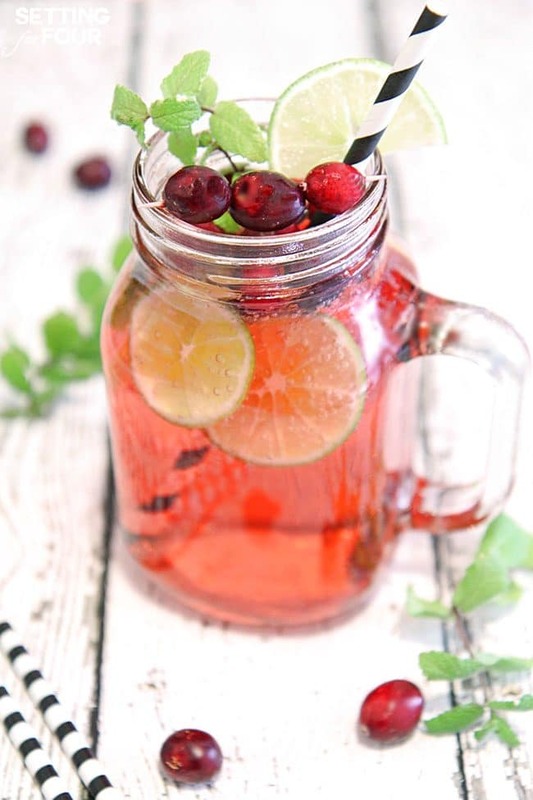 Then head over to the next stop in the Holiday Happy Hour, Setting for Four to get her delicious Cranberry Mojito Fizz cocktail recipe and see where she sends you!! 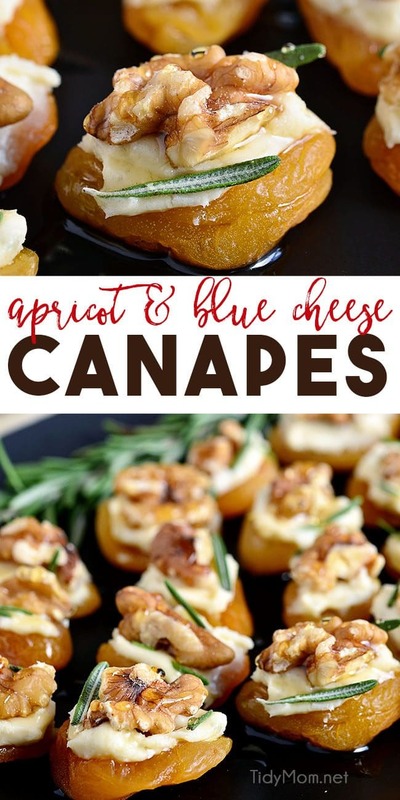 Like this Dried Apricot Blue Cheese Canapes Recipe? Pin It! 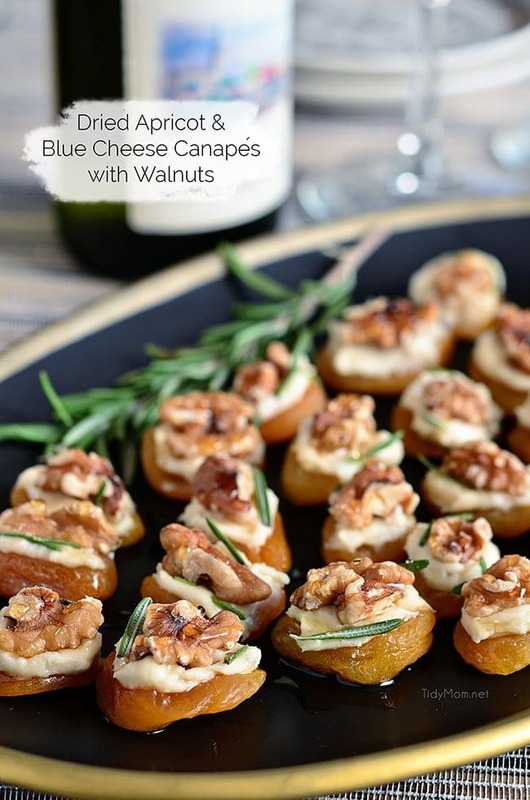 Dried Apricot Blue Cheese Canapes with Walnuts. A simple, elegant and delicious hors-d'oeuvres recipe perfect for any holiday party. place apricots on serving plater. 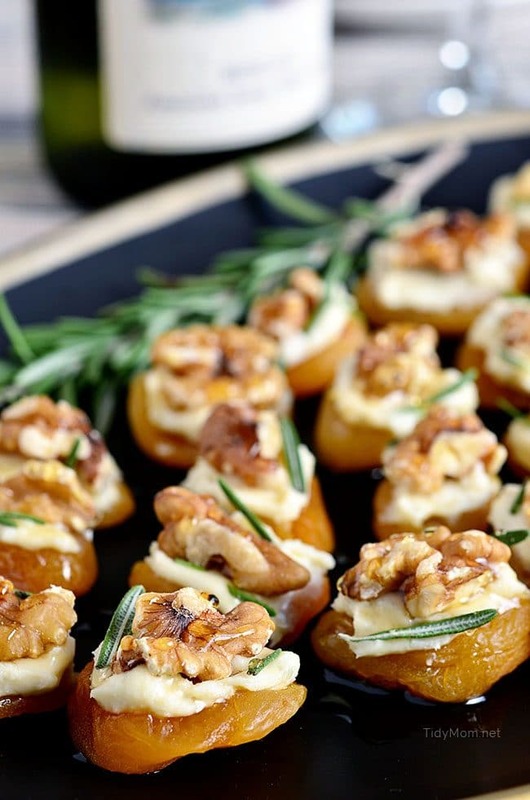 Spread blue cheese on each apricot and top with a walnut, rosemary and a drizzle of honey. if you can't find spreadable blue cheese - you could mix 1/2 room temp cream cheese with 1/2 blue cheese in a food processor or blender until smooth. Or use goat cheese. Make ahead : prepare with out the honey, store in refrigerator. When ready to serve, bring to room temperature and drizzle with honey. Those look so good! I’d probably eat the entire plate by myself! Delicious, Cheryl. One of my favorite appetizers EVER. I make these all the time with various nuts. SO easy! Beautiful for the holidays! I’m glad I’m not the only one still thinking about these!! Because they were bombdiggity!!! Can’t blame you for eating them up. I’ll be wearing an over sized sweater as well!!! lol! This is the perfect appetizer for the holidays! Loving this flavor combination! Oh wow these are fantastic. Perfect for holidays. 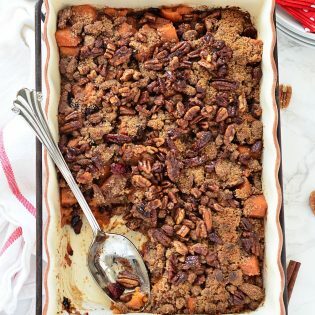 So decadent and sweet! Such a perfect holiday appetizer! What a simple perfect holiday appetizer! Just brilliant. 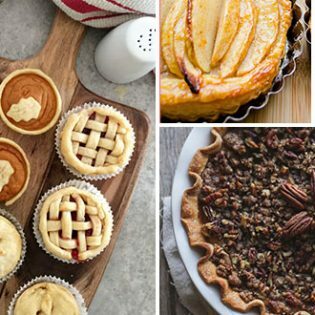 Oooh, these look exquisite and so perfect for entertaining! You had me at apricot and blue cheese!! This combo looks so beautiful and delicious!